35 Radiant Bright Red Hair Color Ideas - Looks Guaranteed to Stop Traffic! This model’s color is good enough to eat! 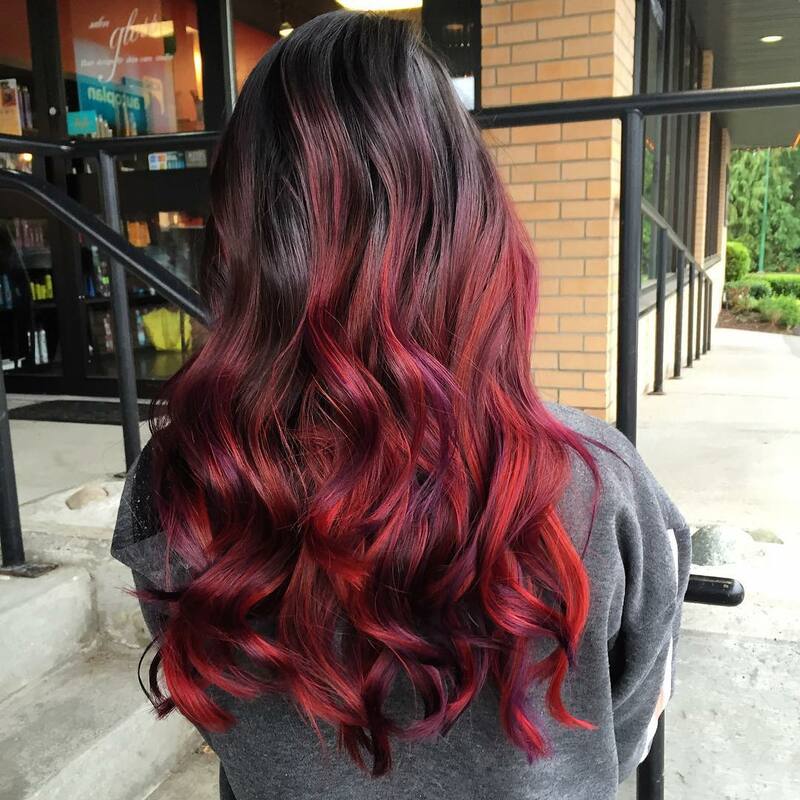 For this look, the stylist used two shades of red – a dark ruby fusion for the roots followed by a shimmering strawberry hue. 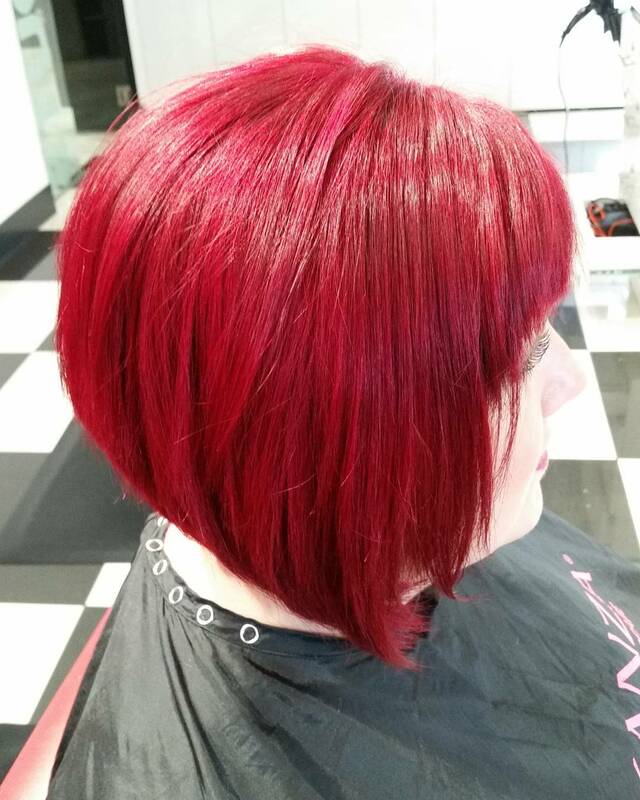 This ruby acts as a lowlight and provides the look with dimension. The hair also has natural looking waves along the edges. When you say you want bright red hair we know this is what you mean! This model's color is good enough to eat! 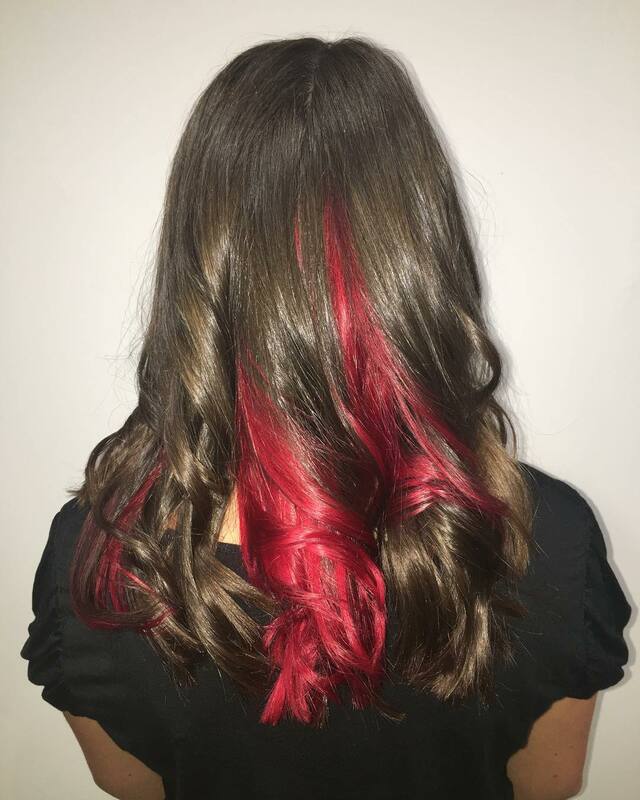 For this look, the stylist used two shades of red – a dark ruby fusion for the roots followed by a shimmering strawberry hue. This ruby acts as a lowlight and provides the look with dimension. The hair also has natural looking waves along the edges. 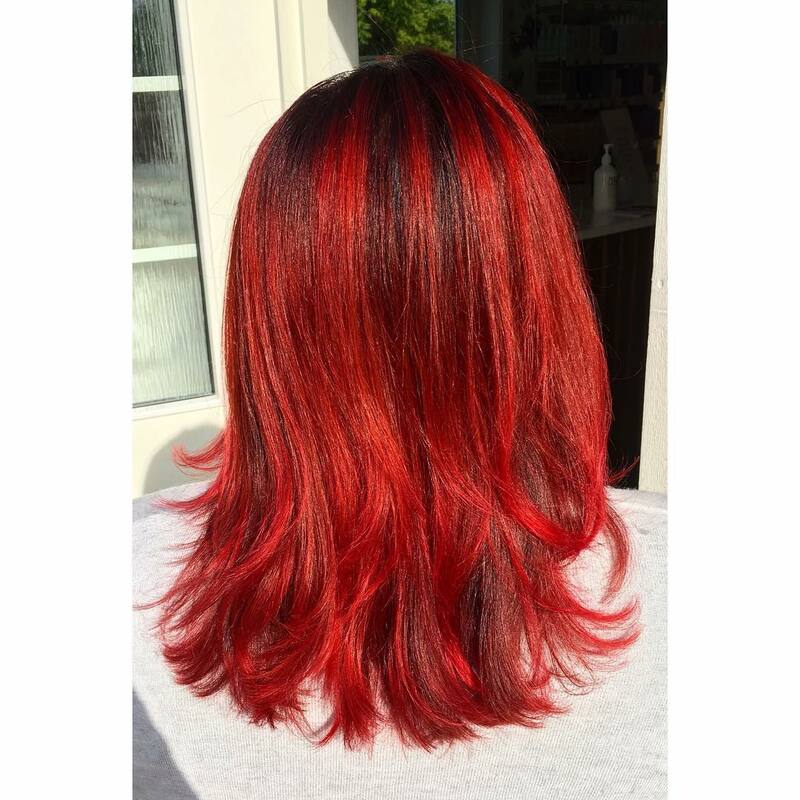 When you say you want bright red hair we know this is what you mean! We love this shade – a bright red rose color with a golden accent. 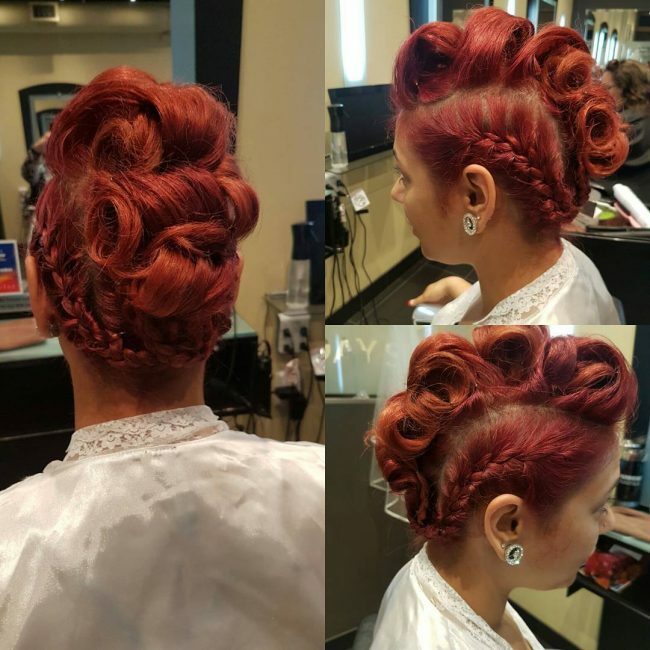 The stylist has used this shade together with goldfish orange highlights to create a neat updo for this model. 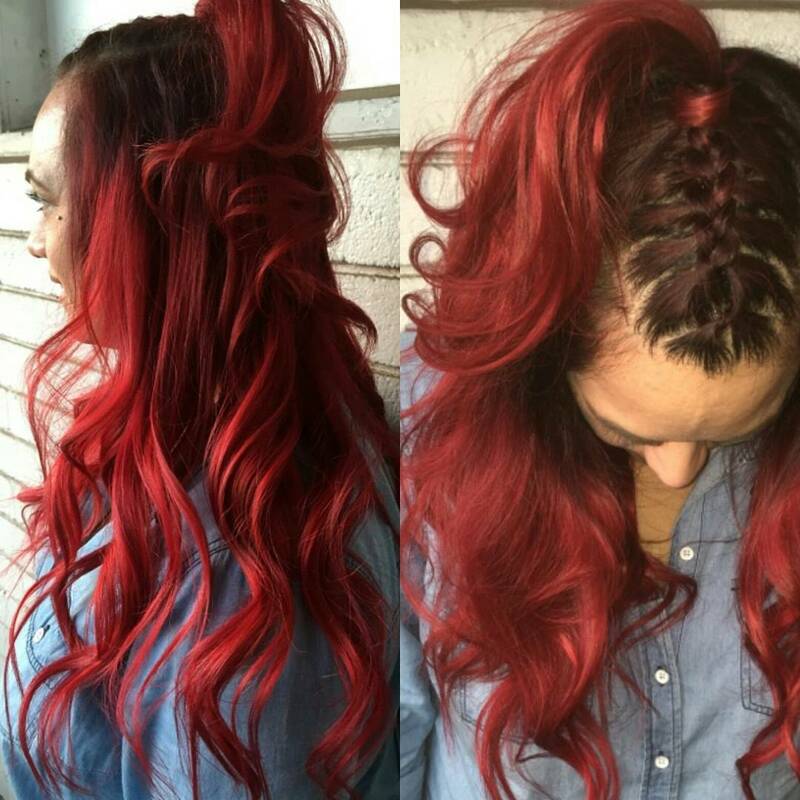 The hairstyle consists of side braids with large structured curls that run down the center. This is a great look for a night on the town or even a date. Team with some red lipstick and you’re good to go! 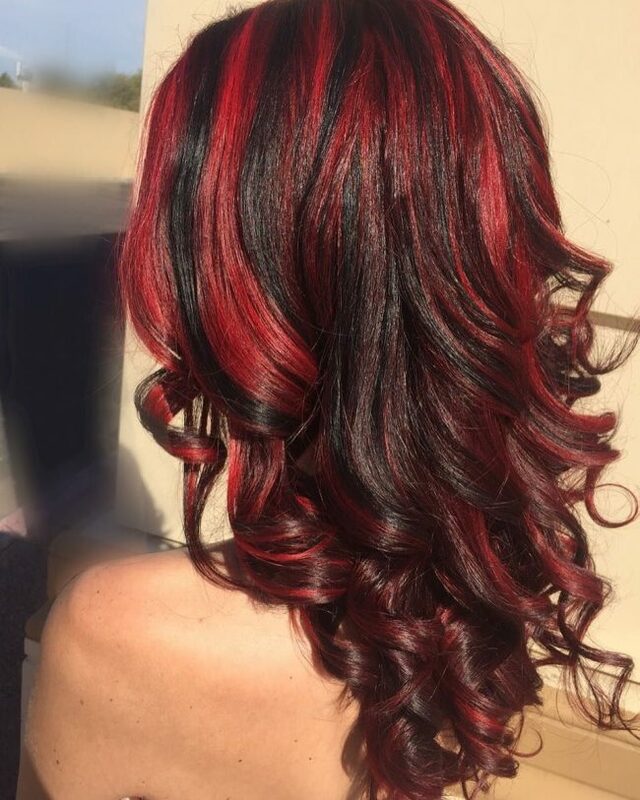 Combining red with black is a great choice and it works especially well to draw attention to medium length locks. 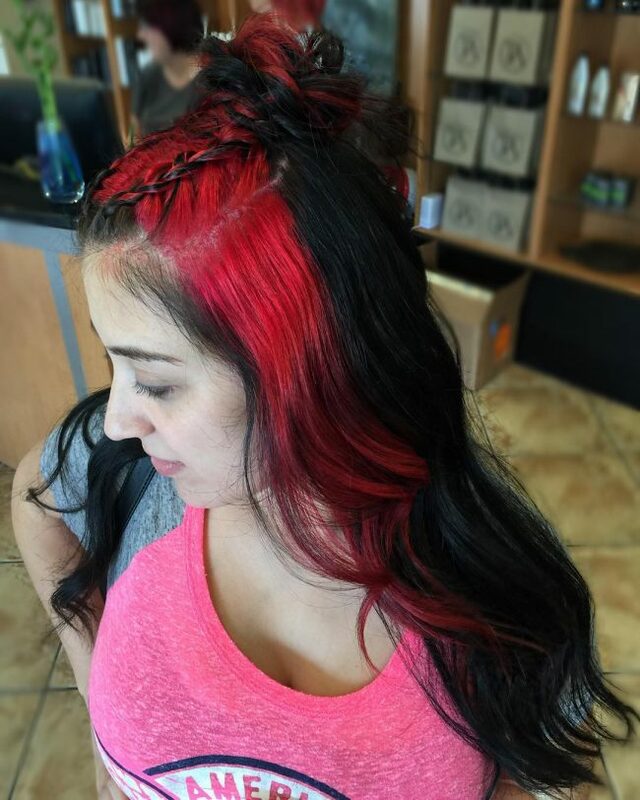 Here the stylist has colored the hair a midnight black then painted in flaming red streaks. The edges are saturated with this bright hue and the locks were ironed out to show off the smooth transition between shades. The color combined with the choppy layered cut also helps to make the hair appear more voluminous. 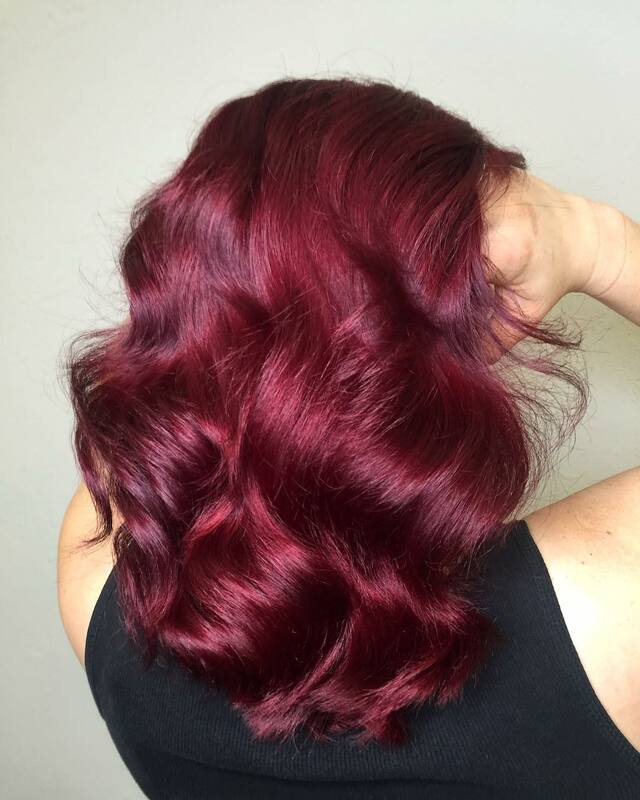 Want to try out red before going for an all over color? Try a color “dip”. This model’s locks are colored with a dimensional mixture of medium brunette shades including hazelnut and chocolate brown. 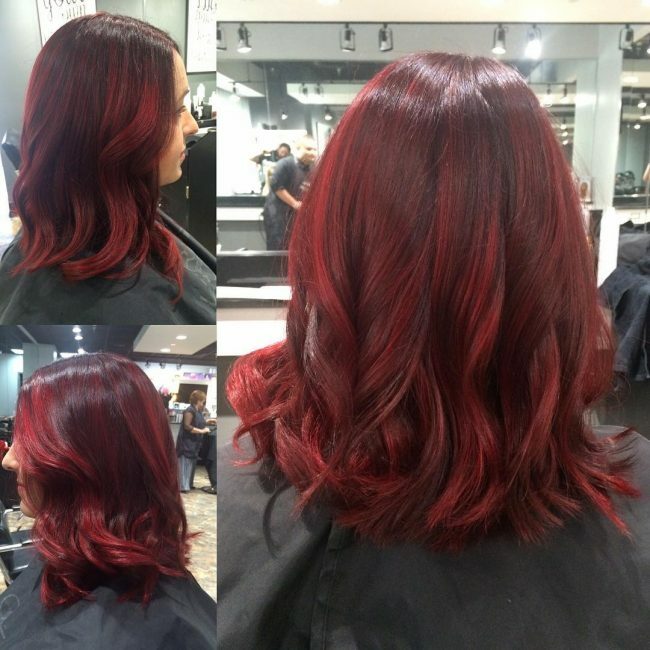 Right at the edges, the stylist added a wash of vivid berry red to create the dipped effect. Surprising hair color like this is exciting and a great way to try out different shades before you commit. 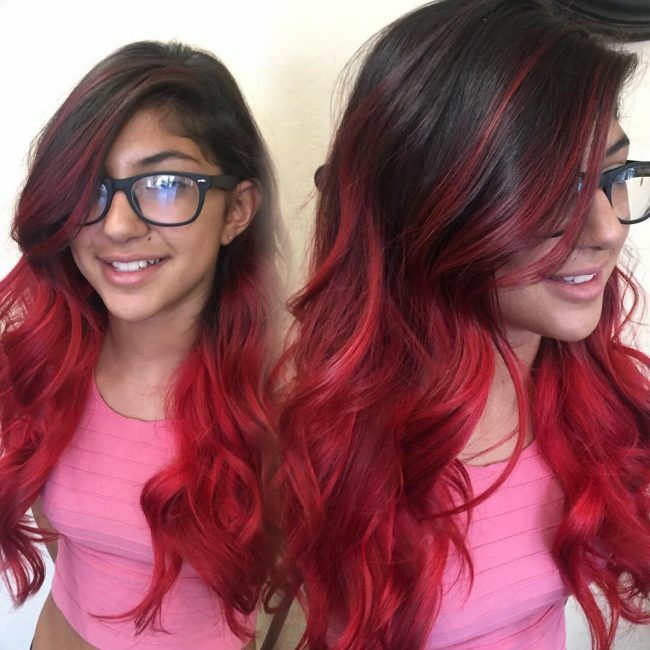 Red is the perfect color for attention grabbing locks and this model's locks certainly get your attention. 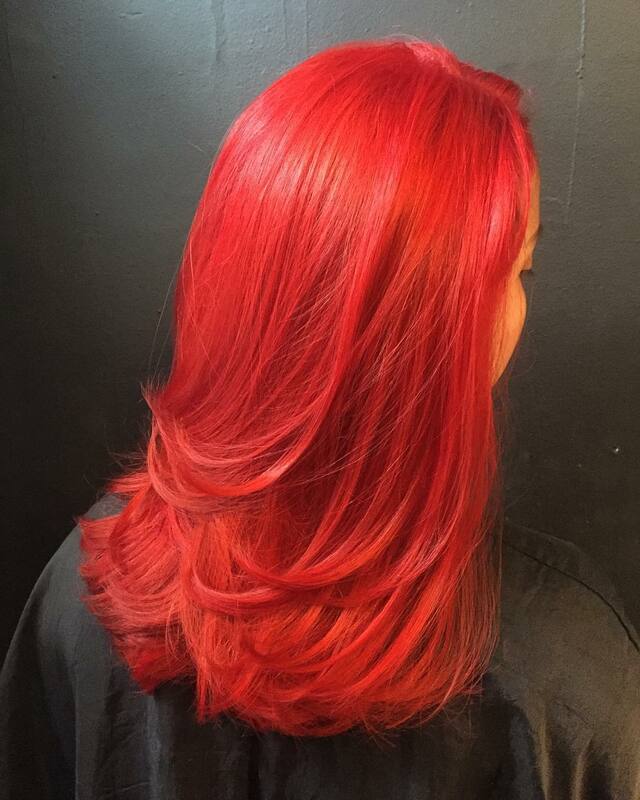 For this look, the stylist has used a bright scarlet hue as all over color from root to tip. The hair has a slight wave and is worn draped over her shoulders. She accessorized with red nails too – a fun and naughty look. Want to treat your long locks to an ombre? 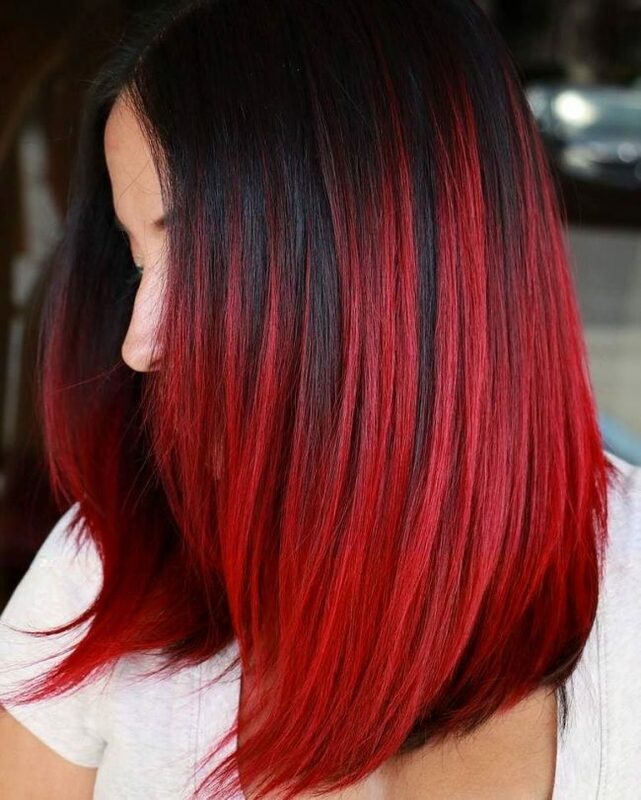 Why not be a little daring and try this brunette to bright red melt? Here the locks start out in a warm ash brown shade which merges into the hot red color from the ears down. The shade used is a flaming candy apple red. It’s got amazing dimension and shine that is just to die for! To finish the look off the stylist also added some soft curls along the edges. Red is a color often used to express love (think red roses etc.) and for someone who loves their hair red is an obvious choice. 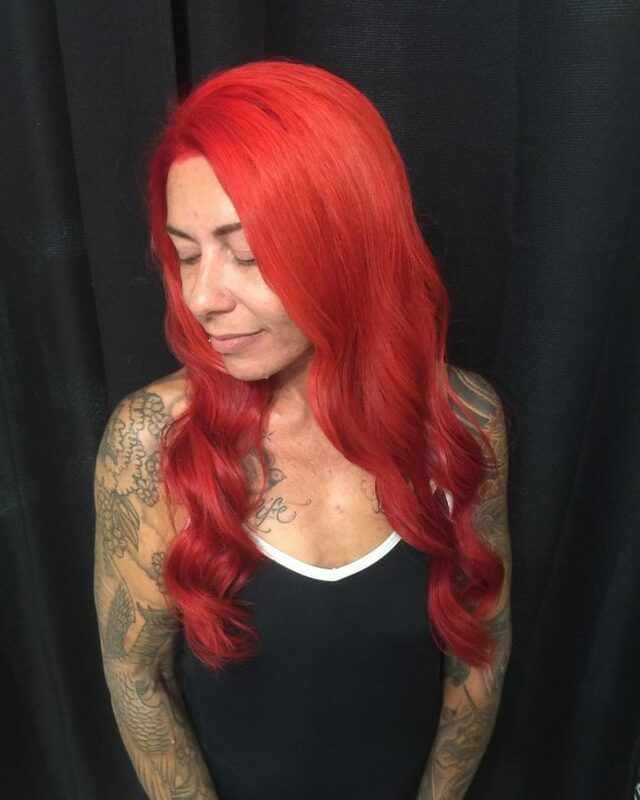 To color this model’s long locks the stylist used a combination of red and orange – this created a beautiful mane that shimmers in a blood orange shade. To add more drama the stylist finished off the look with messy loose curls. In this example, the model's hair begins in a dark rosewood brown; a shade that has also been carried through the style to act as a lowlight. Over this, a shiny maroon was used to add layers of lovely red color. By the way the color starts at different layers it seems that the stylist used the balayage method for application. 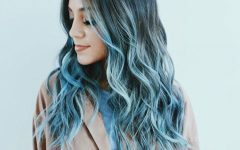 The mermaid hair trend includes green and blue colors as well as yellows and even pretty red-pink shades such as this. 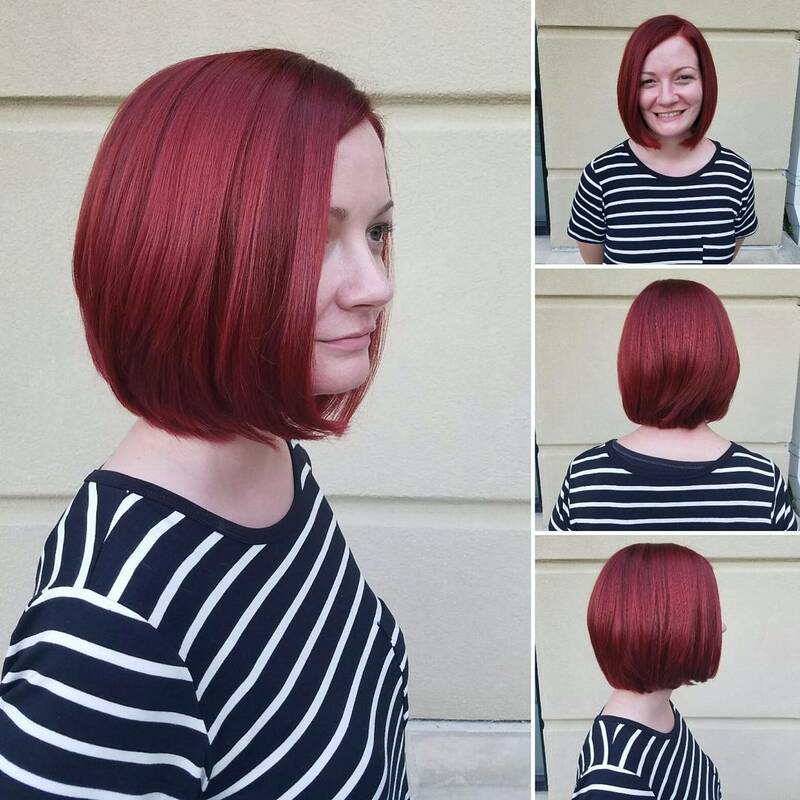 This model has chosen to color her long A-line bob a hot shade that reminds us of red velvet cake. The stylist has ironed the hair into a sleek curtain – perfect for showing off the rich color. In this example, the stylist cut the model's hair in a short choppy A-line bob with a layered fringe. 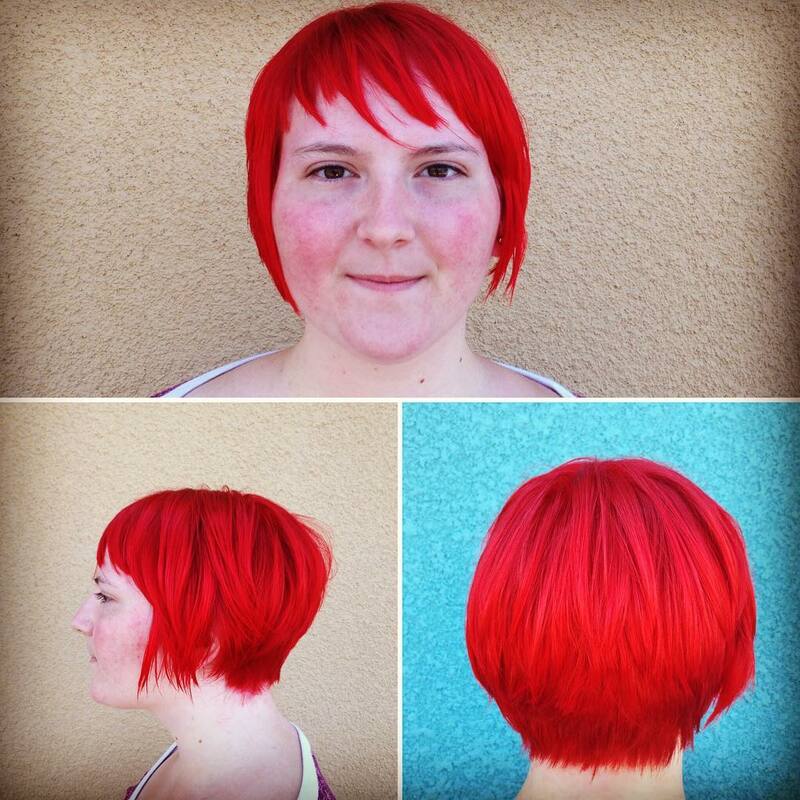 Red in a heady pomegranate shade was used as an all over color and it really adds punch to this short hairstyle. This shade dazzles under the light – beautiful to wear out on a sunny day! 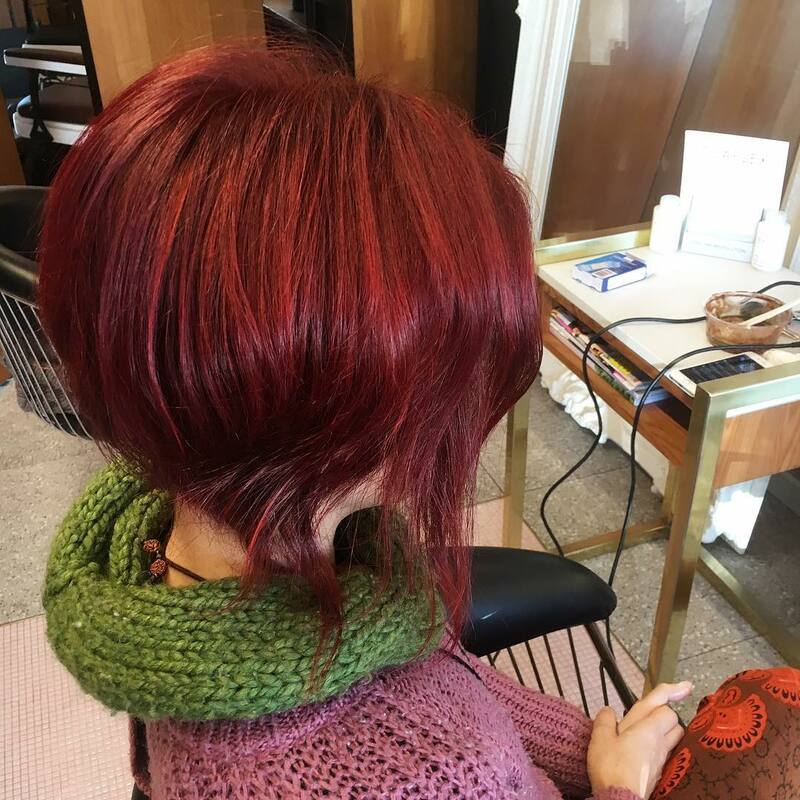 Brunettes and reds will never go out of fashion – if you want a short pixie cut, but still crave volume and vivid color why not try this look? The bottom layer of hair is shaded a warm wood brown with mahogany undertones and for the streaks, the stylist used dark strawberry gold. The hair was blow-dried to give it volume and bring up the color. Call the fire brigade because something is burning up over here! If you want red, but not just any red, you could go all out and use a fire engine red like this as all over color for your hair. The color has a slightly orange undertone and looks great styled simply like this – just a blow dry, center parting and then draped loosely against the models back. For this model’s look the stylist used two shades of a golden burnt sienna red. At the roots, the color is darker, almost a blood red which lightens into a golden shade on top. 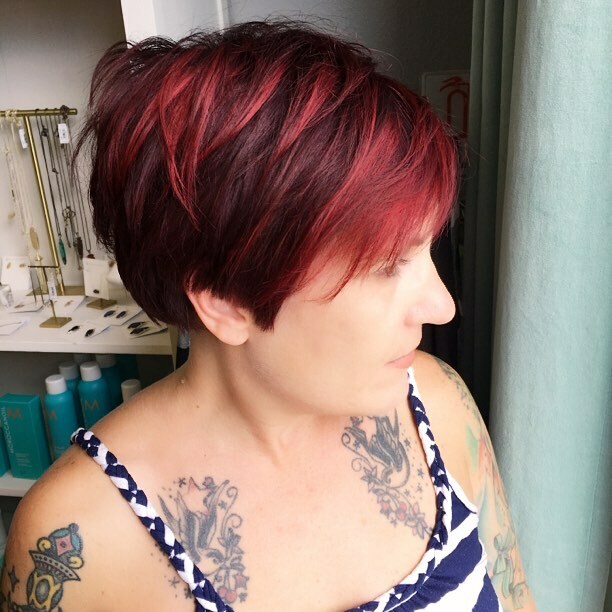 We love this two-tone color on a short sassy pixie cut and the feathered texture and brushed-forward fringe only accentuate the blend of hues even more. Cerise is a shade of bright red that has a distinctive pink undertone and it’s the shade that the stylist used in this example for the bottom section of this model's mane. The color wash starts at the roots with a dark chocolate cherry brown shade before melting into a sea of cerise. Notice the streaks that reach up into the brunette layer; they help tie the colors together. Black and red are an edgy combination, but if you don’t feel like a mainstream look why not steal this model’s style? Her hair is shaded an all over raven black shade apart from two thick streaks close to her face (but separated by a black section). The color that she chose is a bright lipstick red and she’s styled her hair with braids and a messy bun. If you want a long, colorful look but you don’t quite have the length you could always get hair extensions and match them to your colors. This can provide a full and vibrant look, as seen here. This model's hair is a mass of large waves, colored in a medium russet brown at the roots which brightens into strawberry red from the crown down. To create this look the stylist started by trimming the model’s locks into a sweet, structured bob, layered to tuck in at chin level. Then a dark crimson shade of red was applied as an all over color; this hue has a golden undertone which makes it reflective and dimension. This is a professional look that still has a fun edge to it. 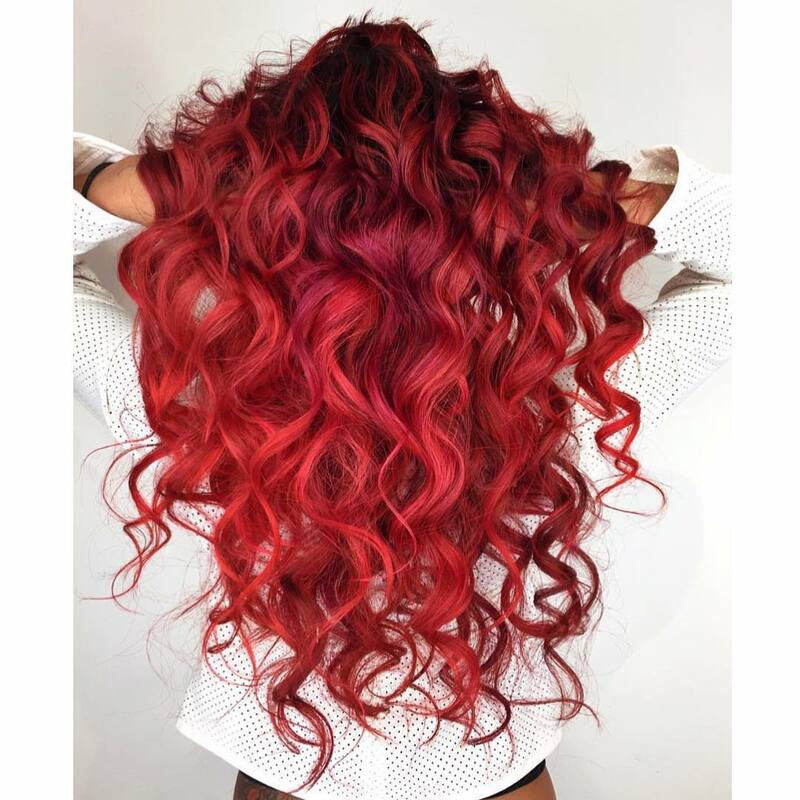 This wild style combines not only incredible color, but also great styling – what girl doesn’t love a mass of thick ringlet curls like this? This model’s locks start in sable and deep plum before blending into a vivid cherry hue. In the center and along the edges the stylist used a wine shade to provide contrast. In this picture, we see an espresso base color that has been carried through the model's medium length locks with streaks of dark and light ruby shades painted over. Balayage provides a color melt effect that cannot be matched by the foil method. 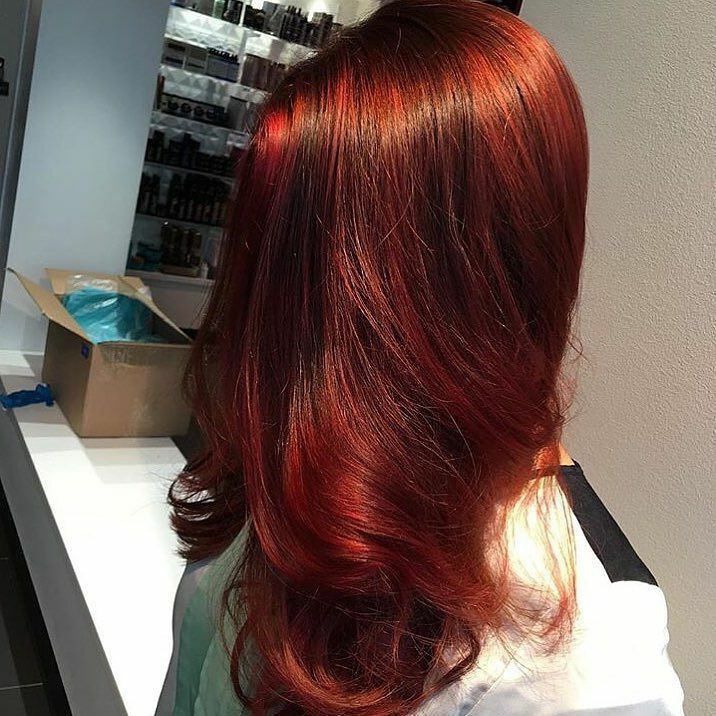 To finish this look off the stylist added some loose waves just along the edges – to further mix the magnificent reds together. 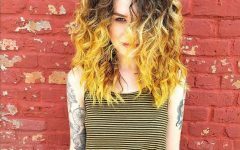 Color has an effect on our mood, so why not use your hair as a pick me up? Choosing a color like this vermilion – which is a bright shade of red-orange, has an energizing effect – just what a busy girl needs! 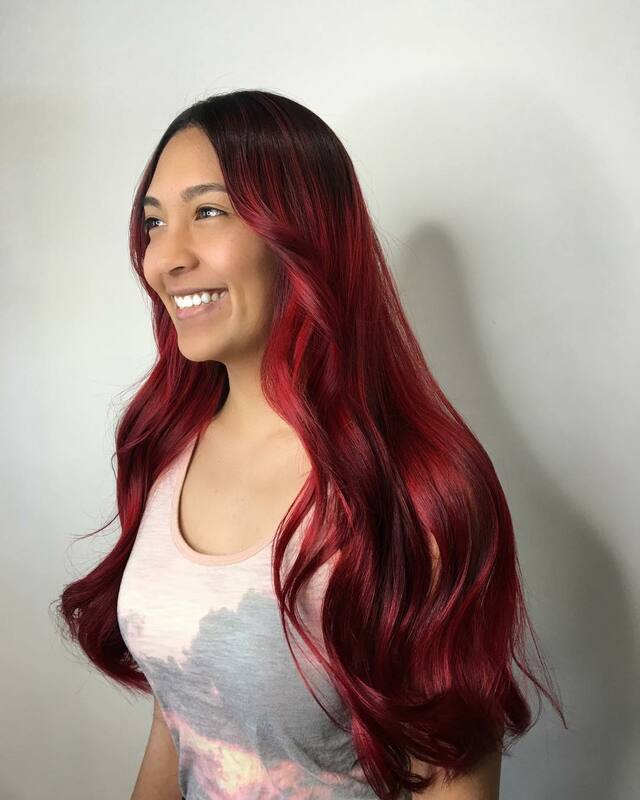 This model’s medium length locks are colored in this shade together with splashes of ruby and styled with a structured wave to help the hair catch the light. If you are constantly on the go, you want an easy to maintain style – but that doesn’t mean a boring look! 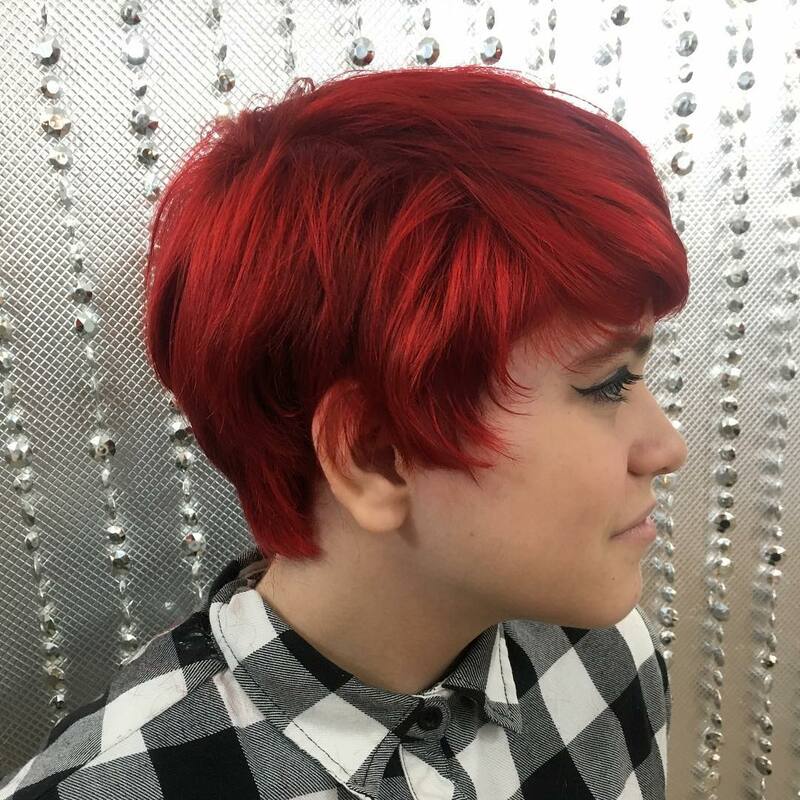 This short asymmetrical haircut is easy to manage but to give it extra sass the stylist used a blend of ruby and scarlet shades for the color. Under these shades, there is a deeper maroon hue as well, which gives the look structure and provides contrast for the bright colors. When you want the brightest red around it’s time to turn to Pravana’s neon range. 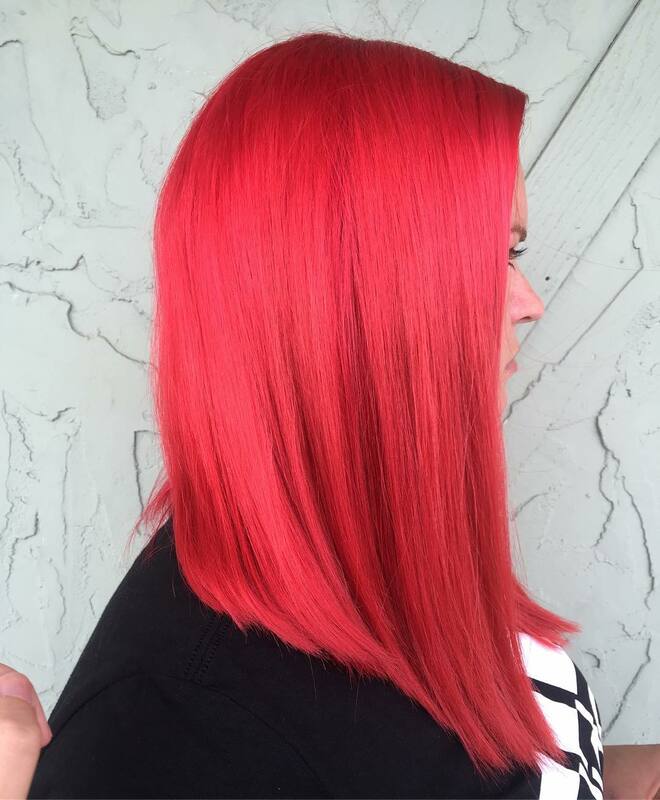 In this example, the stylist used an electric red color which she combined with hints of neon orange and pink to create this highlighter red look. The model has a short choppy cut with layers at the back – perfect for showcasing such incredible color. We love the peek-a-boo hair trend! In this fashion, the locks usually have an all over color in brunette or blonde (even black) with a thick streak of bright color secreted underneath. This is a great style if you need to cover up bright hair during the day but want to show it off at other times. In this example, the model's hair is a dark ash brown with streaks of deep pink color. This model’s locks begin with a dark chocolate cherry base color before melting into lush vivid red shades. The stylist has managed to create a palette of reds including claret (undertones) and rose red. We love the dark and light hues that play off each other and add depth to her look. 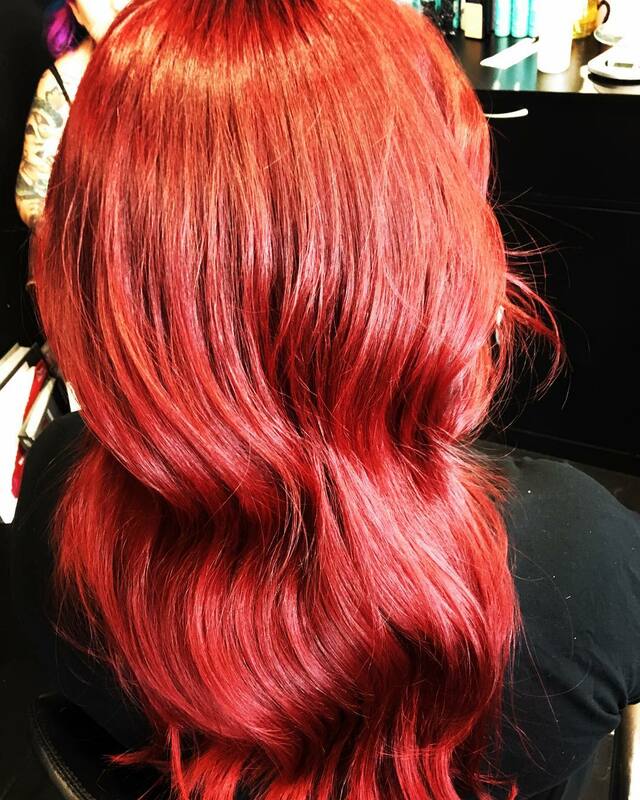 This gorgeous bright red hair was blow dried and given a center parting with a few loose waves on the edges and next to the face. The base color used for this model's look is a medium cerise over dark shadow roots. 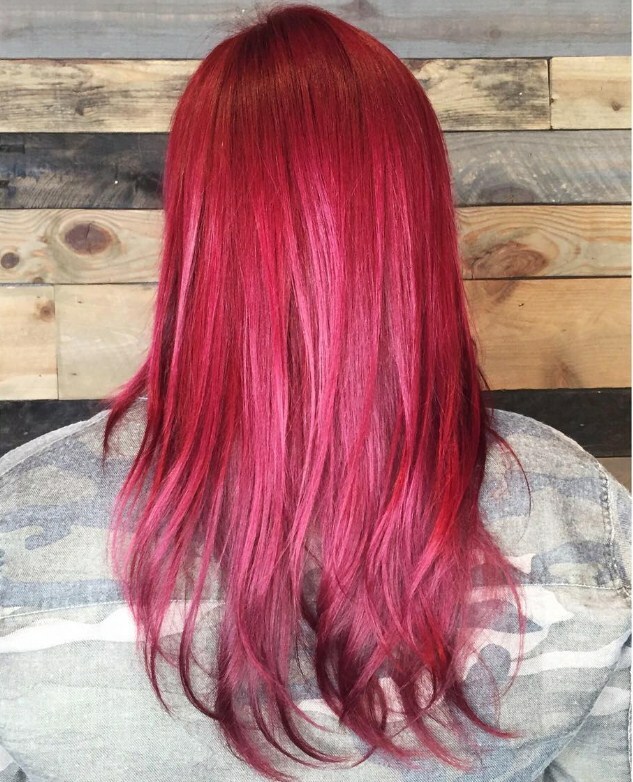 This cerise shade gently gives way to a wash of dark pastel pink-red and all along the edges the stylist used magenta – creating a dipped effect. This is a unique style with a well placed lighter shade that will always look like it is reflecting the light – first class! Okay, why have shadow roots of dark brown or black if you can have a bright purple base color instead? 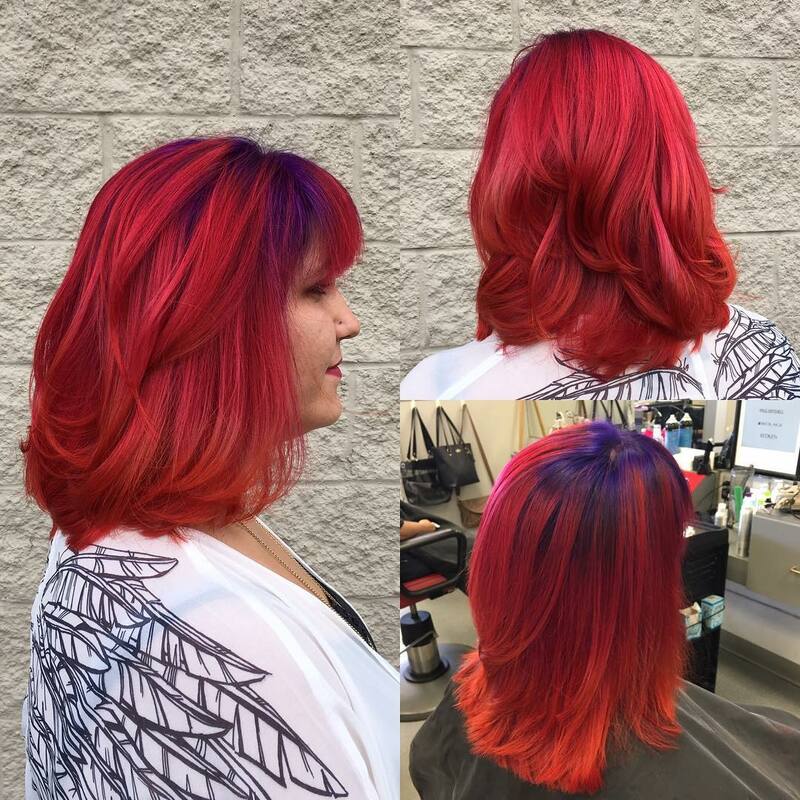 This is such a creative style – sure to turn heads not only for the dazzling combination of royal purple, vivid red and blood orange (tips) but also for the way these colors have been used together. 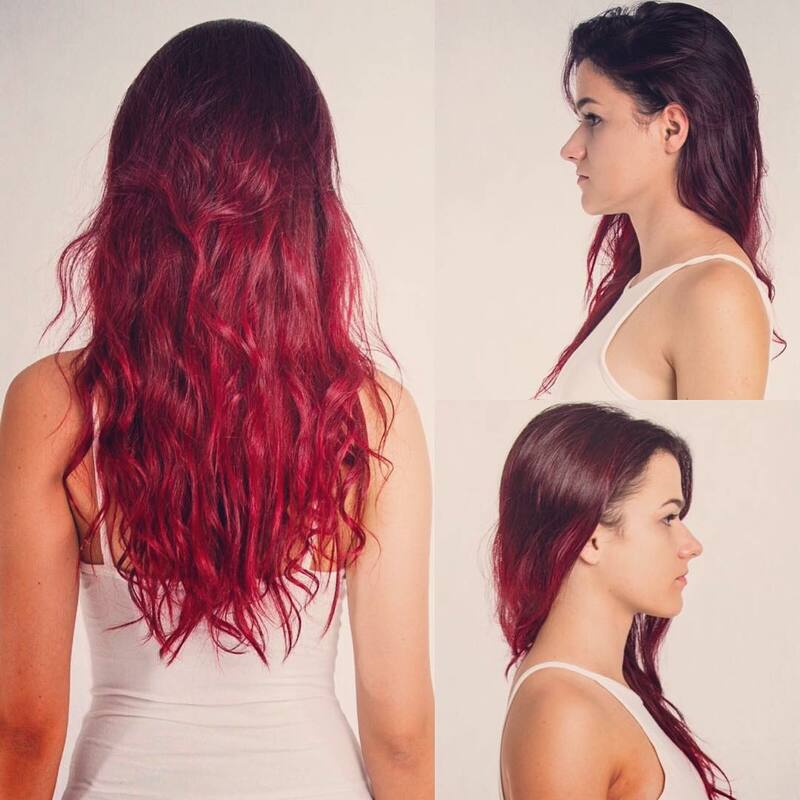 Beach wave hairstyles also look amazing in the right shade of red. Try it for yourself and ask your stylist to give you this model's look. 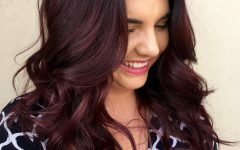 Begin with a dark brown base color – this one has a puce undertone (deep red/violet) which melts in layers of hot strawberry red just after crown level. Finish off with a messy beach wave and you’re ready to go! To color this model’s medium short locks the stylist used two different shades. The first, which we can see underneath, is a glowing wine hue and on the top locks are plum. Darker shades like this are impactful and look even better with some stylish waves. 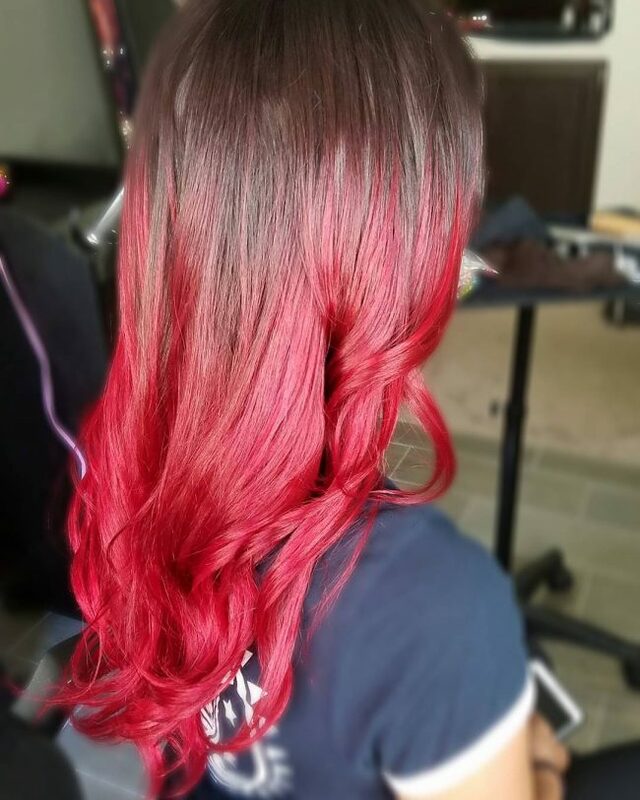 This vivid red color has a pink undertone and just a hint of neon. It’s been combined with dark shadow roots and styled in a laidback style – a center braid with the hair loose on the sides. 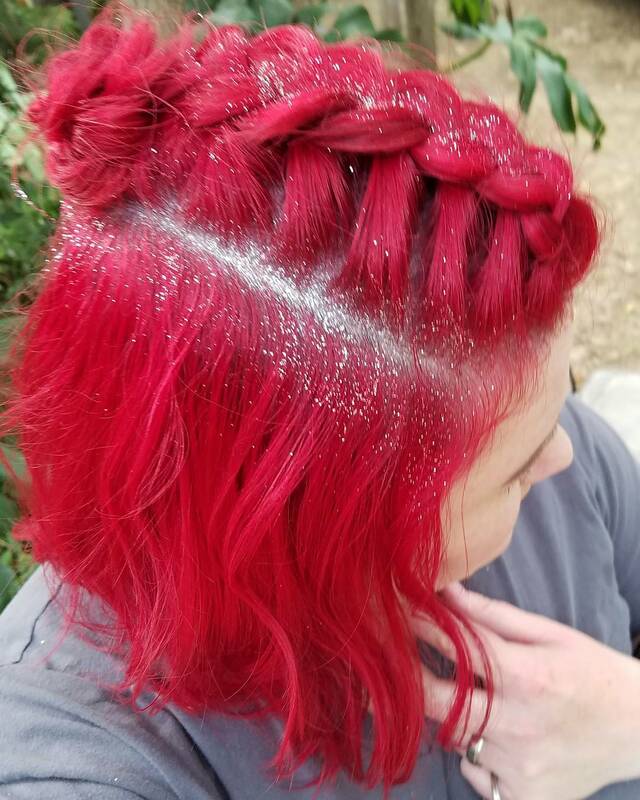 To add just a little more sparkle the stylist added a splash of glitter! If you really want to create a fiery effect, try using not only reds but also wine and orange shades. This model’s locks begin in sable brown before melting into a warm mixture of flaming ember orange, dark wine, and burgundy. To finish the stylist added curls just along the edges to mix the shades together. Vivid hair color will make you look like the superhero that you are! For something bright, but classy, why not try this shade? It’s a bright blood orange shade – a red with a strong orange undertone. Add some big waves to the lower layer and you’ve got a vivid but neat hairstyle. Romantics will love this smooth red and black combination. Here the base color is a midnight black followed by thin streaks of brilliant ruby and a darker wine shade. This look is full of shine and extra body thanks to the ringlet curls. 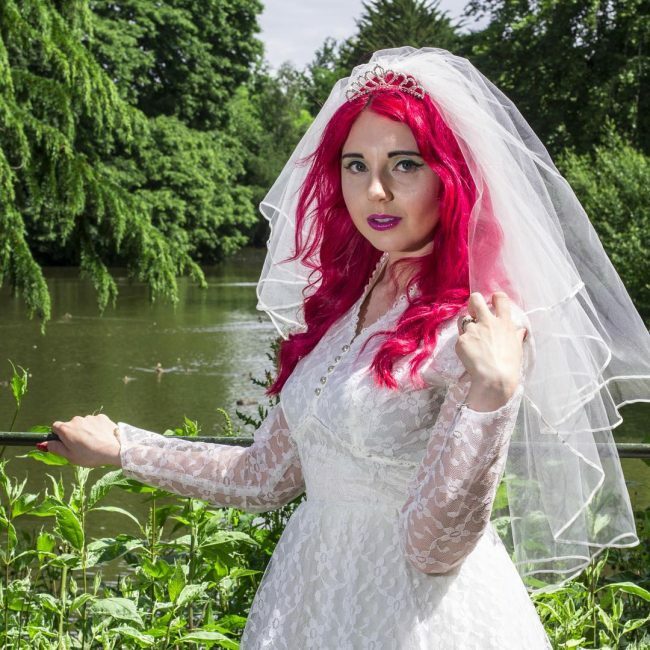 Don’t listen to anyone who says bright red hair can’t work for a wedding look. Here is a beautiful example of such a look. 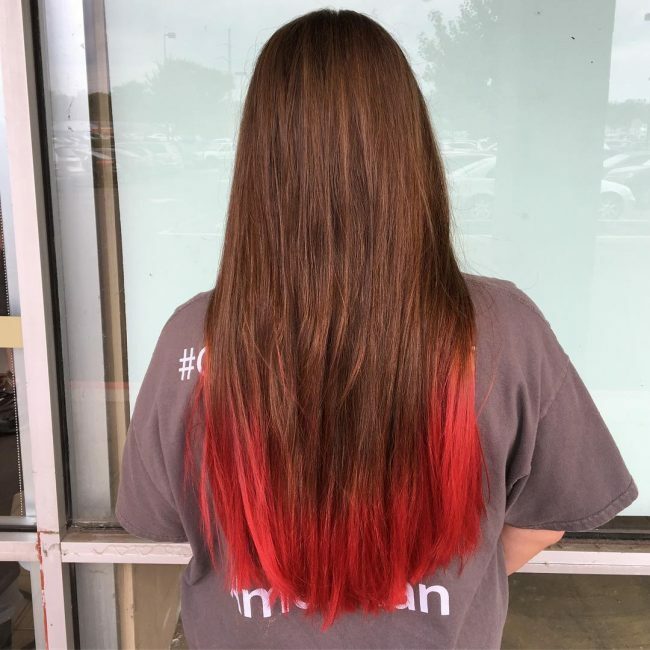 The stylist used a palette of reds to shade this models hair, including ruby fusion, and scarlet rose with bold pink-red highlights. Sometimes it can be a little hard to tell pinks from reds when looking at vivid hair color. 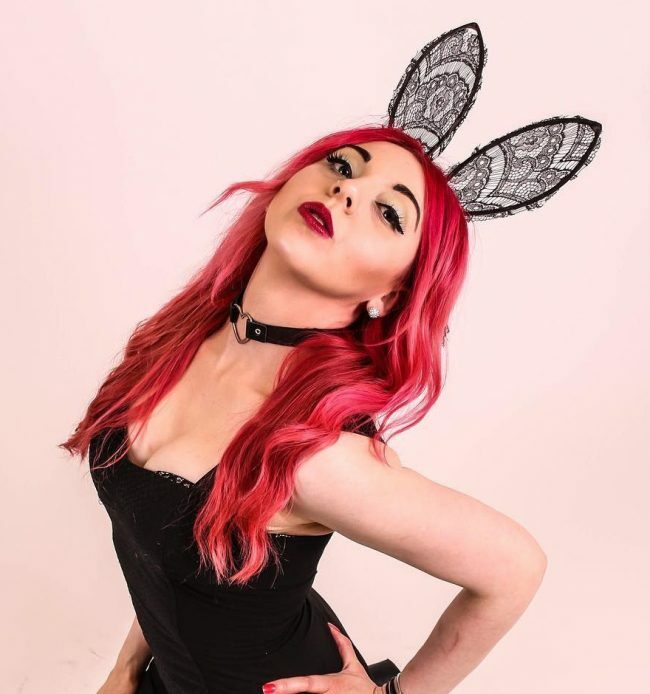 In this case, the model's hair is actually a bright pink and red combination – quite a dark highlighter pink in fact, with strong red undertones. Color like this combined with pale skin tones or clothing is sure to get you noticed! 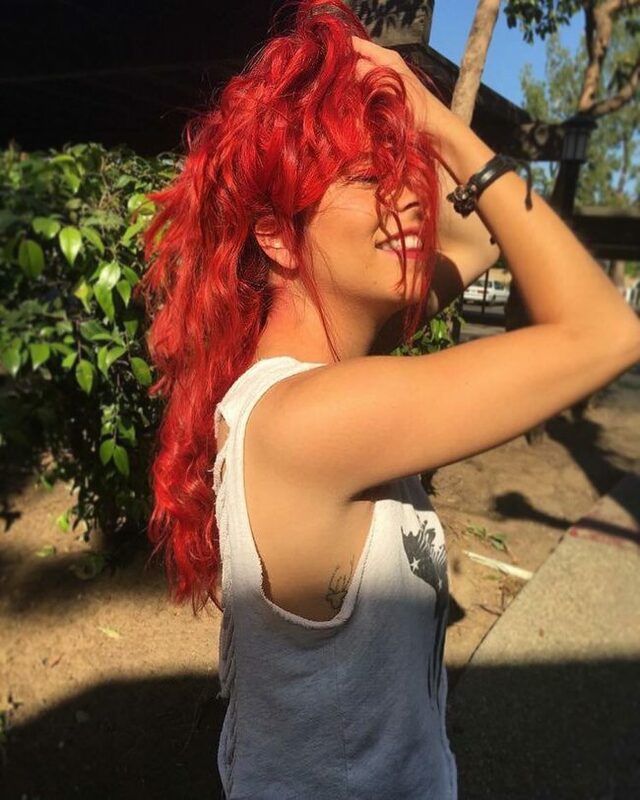 Everyone should try rocking red hair at least once and if you are going to go red, then why not go for the brightest shades? Whether it’s glimmering ruby or neon highlighter hues, this is a look that is sure to lift your mood and the moods of those around you. Choose from ombres with mahogany or sable colored roots or mix your reds with other bright shades for something edgy. Want to be a little mysterious? Red and black could be the combination you’ve been looking for. 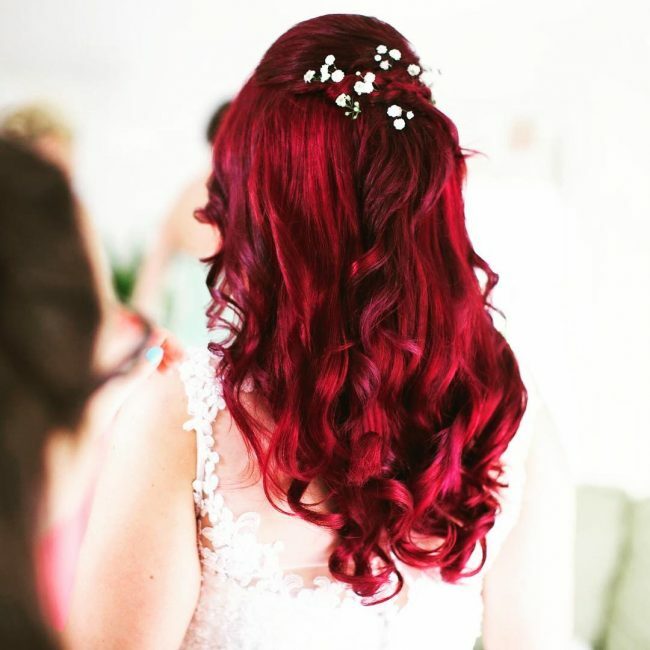 Bright red hair is great for party hair and, as we’ve seen from these examples, even special occasions. Pick your shade and dare to go red – there’s never been a better time than right now!